Honest and open-minded talk about Aceh and West Papua is rare in Indonesia. Yet some Indonesians recently came together in London to have just such a conversation. Students from the Indonesian Student Association organized an event to discuss both conflicts. It was a kind of people-to-people discussion. The conclusion reached was that only democratic and peaceful approaches, not military ones, would find solutions. An appropriate and apposite conclusion will always be found when discussions of conflicts reach beyond established and orthodox thinking. In the Aceh and Papua cases, this orthodoxy is mainly reflected in the idea that the conflicts embody threats to Indonesia's national integrity. It is also the case when people sit and talk about the problems and find many areas of common ground, instead of simply differences. They can look at the problem substantively, and get beyond the headlines and media reports. One fundamental aspect of the Aceh and Papua conflicts is the dreams of both peoples to create a new society; a better society. This notion of a new society shows that the Acehnese and Papuans are looking forward to their futures, not simply their long-gone pasts and histories as some have argued they are trying to do. In the case of Aceh, it is often said that the Acehnese merely want to rebuild a replica of their past kingdom. They want to rebuild a golden era in time. Yet while it might be true that they want to build a new golden era, it is absolutely not the case that they want to build a replica kingdom of old. This is especially true of the majority of civil society groups and the social movements in Aceh. They consider history to be important, but recognize that history could have been better and that the most important thing is the future. In Aceh this has become even more apparent in the aftermath of the tsunami. Some Acehnese who tend to draw heavily on references to history in discourse about Aceh only do so because there is something wrong with the present. If there were nothing wrong with the present, history would be little more than a memory, a lesson, a quiet nostalgia for years gone by. 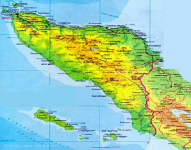 The ideas around a "new" Aceh and a "new" West Papua have much in common with the social movements in Indonesia that likewise talk about a new Indonesia; an Indonesia that is better. However, many of us fail to see this common ground because we are divided by the rhetoric of the enemies of the would-be new Indonesia, the new Aceh and the new Papua. These enemies are from the bad-old Indonesia who would like to maintain Indonesia in its old centralized, corrupt and oppressive form. To manufacture divisions within society they usually call on emotive, self-aggrandizing simplification of the problems in Aceh and Papua. "We are there to wipe out the separatists." "The separatists are the problem; we are here to defend the integrity of the motherland." This rhetoric has no substance beyond emotion, and makes an easy abstraction of a complex and detailed problem. Indeed, it discourages us from looking at the details. The details show the awful life of the Acehnese and Papuans. The military presence there is extremely oppressive. In some districts of Aceh there are more military posts than schools or medical centers. The Acehnese are still required to hold a personal identity card that distinguishes them from the rest of Indonesia. In Papua there will soon be one soldier for every 45 Papuans. In both places there is little freedom of expression. Those who oppose Jakarta's role or strategy in their homeland can easily be eliminated with heavy legal penalties and jail sentences. This heavy-handed and old-school Indonesian way of dealing with the two areas is not working. The late, prominent human rights activist Munir criticized the government fiercely for maintaining a military approach to solving the problems of Aceh and Papua. He became hugely popular among Acehnese and Papuans because of this. Munir advocated another kind of Indonesia, one that would deal with the problems of Aceh and West Papua peacefully. If there was one person who could make the Acehnese see themselves as having a real place within Indonesia, and consequently have a belief in Indonesia, Munir was definitely that person, but even Munir was killed. The simplistic, emotive and violent approach, on the other hand -- the one taken, for example, by the military -- means that despite all the rhetoric about ensuring the Republic of Indonesia's territorial integrity, the opposite result is achieved. In reality, those who claim to defend Indonesia are those who, in practice, encourage separatism by their actions on the ground. Their actions serve only to further alienate Acehnese and Papuans from the country the military claim to be defending. It is critical for the success of this new era that Indonesian civil society groups speak out more against the military approach to deal with the problems in Aceh and Papua because another more-peaceful Indonesia is possible.